This resume sample for a nurse trainer specializing in medical-device instruction shows how to highlight your clinical expertise and training skills. Does your resume convey how valuable you are in supporting business operations? To be a successful candidate for health care jobs, resume expert Kim Isaacs says it helps to have a comprehensive resume. 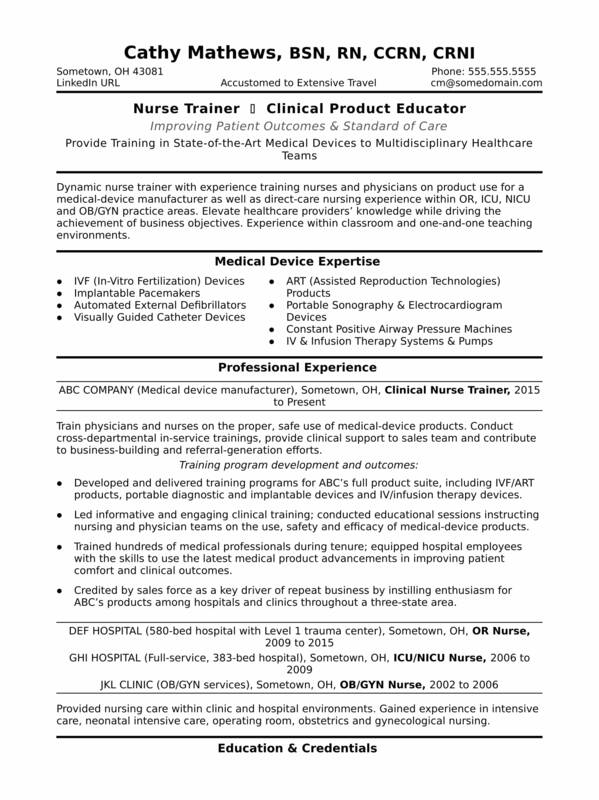 To learn how to highlight your clinical expertise and training know-how, view this resume sample that Isaacs created below for a nurse trainer specializing in medical-device instruction. You can also download the nurse trainer resume template in Word. And if you need more help, let the experts at Monster's Resume Writing Service create a high-impact resume for you that will impress employers. According to the Bureau of Labor Statistics (BLS), you'll find the highest level of employment for nurse instructors and teachers in the following states: New York, California, Texas, Pennsylvania, and Ohio; and in the following metropolitan areas: New York City, Philadelphia, Los Angeles, Boston, and Denver. As a nurse trainer, you can expect to earn a median wage of $71,260 per year, according to the BLS. Additionally, you can search for nurse trainer jobs on Monster. Dynamic nurse trainer combining five years of experience training nurses and physicians on product use for a medical-device manufacturer and four years of nursing experience within OR, ICU, NICU and OB/GYN practice areas. Elevate healthcare providers' knowledge while driving the achievement of business objectives. Training background includes experience within hands-on, classroom and one-and-one teaching environments. Train physicians and nurses on the proper, safe use of medical-device products. Conduct cross-departmental in-service trainings, provide clinical support to sales team and contribute to business-building and referral-generation efforts. Developed and delivered training programs for ABC’s full product suite, including IVF/ART products, portable diagnostic and implantable devices, and IV/infusion therapy devices. Led informative and engaging clinical training; conducted educational sessions instructing nursing and physician teams on the use, safety and efficacy of medical-device products. Trained hundreds of medical professionals during tenure; equipped hospital employees with the skills to use the latest medical product advancements in improving patient comfort and clinical outcomes. Credited by sales force as a key driver of repeat business by instilling enthusiasm for ABC’s products among hospitals and clinics throughout a three-state area. Provided nursing care within clinic and hospital environments. Gained experience in intensive care, neonatal intensive care, operating room, obstetrics and gynecological nursing.